Transferring data from iPhone 6 to iPhone 8/8 Plus might pose difficulties if you don’t know the proper procedure. This article examines some simple ways to transfer data from your one iPhone to another conveniently and safely. iMyFone TunesMate is a multi-feature transfer tool that allows you to transfer your backups from one iPhone to another effortlessly. It is a recommended option because it allows you to transfer media files separately as you won’t have to transfer all your data when you only need selected files. With blazing fast and clean interface, you will feel no hassle transferring all your iOS data within few minutes. Besides, it's highly spoken by many professional medias, such as Getintopc, Geekreply. Blazing fast transfer speeds. It will only take a few minutes to backup and restore your data. Two-way transfer, which means you can transfer data from your iPhone to your computer and vice versa. Multiple files are supported including music, videos, notes, ringtones, voice mails, messages, contacts, photos, etc. Convenient 1-click transfer options, allowing you to quickly start the process without even opening iTunes. 100% safe transfers. You won’t lose any file or data during any of your backups and restorations. Step 1: Download iMyFone TunesMate from official website, install, and then run it on your computer. Step 2: Connect your iPhone 6 to your computer via USB cable, iMyFone TunesMate will detect it. 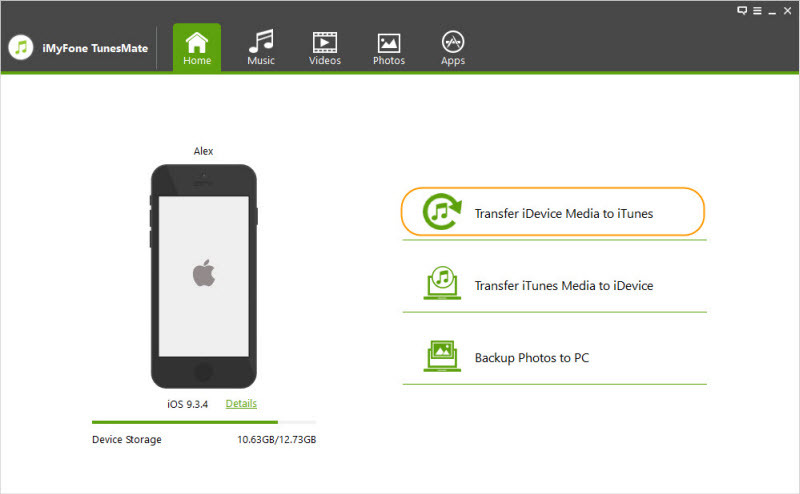 Step 3: Use ‘Transfer iDevice Media to iTunes’ option in order to back up your data. The software will ask which file types to backup. Select the file types you wish and click ‘Transfer’. Step 4: Once the process is complete, disconnect your iPhone 6 from your computer. Step 5: Now connect your iPhone 8/ 8 Plus to your computer via USB and wait for iMyFone TunesMate to detect it. Step 6: Once your newly connected device is detected by iMyFone TunesMate, use ‘Transfer iTunes Media to iDevice’ option to restore your latest backup. That’s it! You have successfully transferred your iPhone 6 data to your iPhone 8/8 Plus. 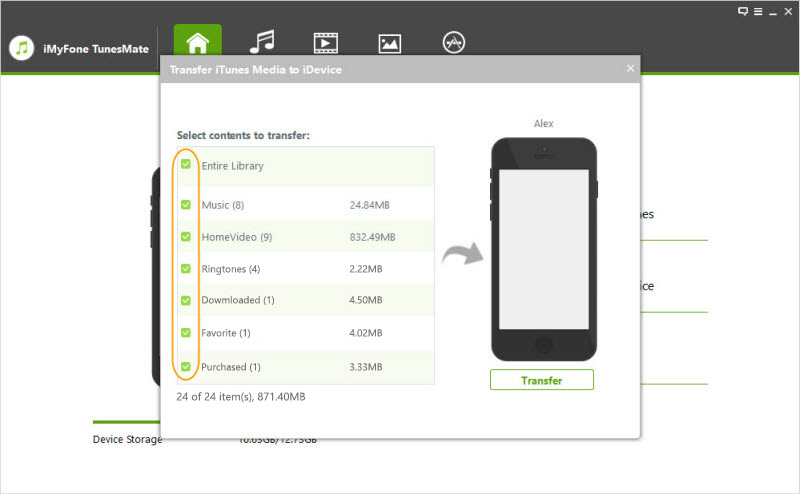 You can see how easy and fast this method of transfer is as compared to iTunes and iCloud. Step 1: Connect your iPhone 6 to your computer via USB cable and start iTunes, make full backup of your iPhone 6 via iTunes. Step 2: Turn off your iPhone 6 once the backup is finished so that there won’t be issues with iCloud backups. Step 3: Now connect your iPhone 8/8 plus with iTunes. Step 4: Use Restore from iTunes Backup option. Step 5: iTunes might ask you which backup to restore if you have multiple backups available. Choose the latest one and click Continue to start the restoring procedure. Step 6: Once the process is complete, your iPhone 8/8 Plus will automatically restart. This process of transfer is not difficult, however there are some limitations such as you can’t choose what to transfer, the process may fail unexpectedly, slow transfer speed, iTunes may crash, etc. 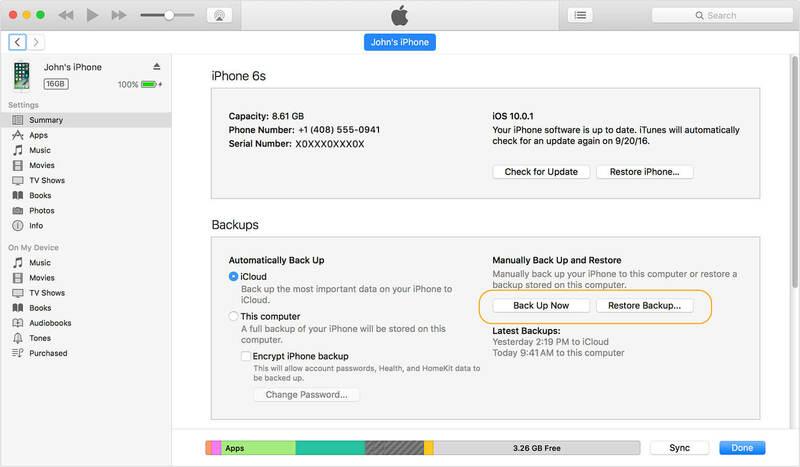 Step 1: First, make backup of all the data on your iPhone 6 if you haven’t done it already. Step 2: Go to settings of your phone, select your Apple ID’s profile and choose iCloud. There, you will find an option named ‘iCloud Backup’, select it and start the backup process using the ‘Back Up Now’ option. Step 3: Now that you have made data backup of your iPhone 6, it is recommended that you turn the device off. 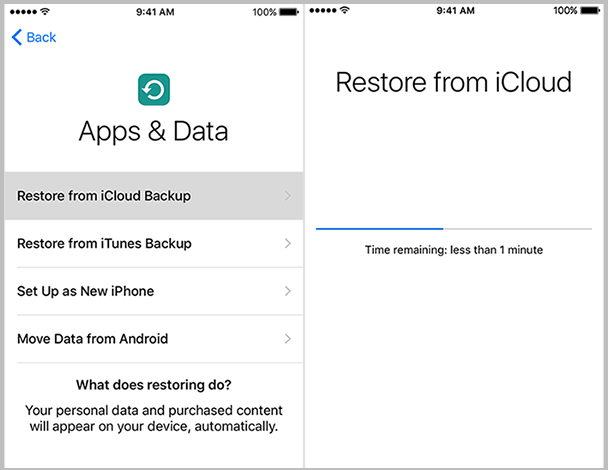 Step 4: On your iPhone 8/ 8 plus, go to Settings and restore your iCloud backup using ‘Restore from iCloud’ option. This option is available in ‘Reset’ section. If you have multiple backups, you will be asked to choose one. Select the latest one. Step 5: Restoring process will start and your phone will be ready to use once the process is complete. Slow transfer speed (depends on your internet). There is no guarantee that the process will go smoothly and trouble-free. There are limitations on which file types you can transfer as iCloud supports transfer of reminders, notes, calendar, contacts, email, photos, etc. and does not allow you to transfer apps, ringtones, music, photos not in Photo Stream, etc.